Ulrichite: Mineral information, data and localities. Named in honour of George Henry Frederick Ulrich (7 July 1830, Zellerfeld, Germany – 26 May 1900, Flagstaff Point, New Zealand), for his contributions to the mineralogy of Victoria, Australia. He was a geologist and lecturer in mining at the University of Melbourne. He was also curator of the mineral collection at the Industrial and Technological Museum in Melbourne. 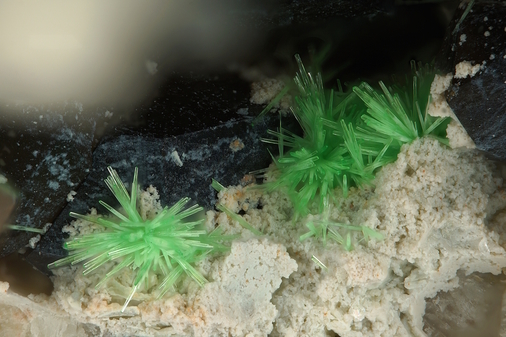 This page provides mineralogical data about Ulrichite. Turquoise 4 photos of Ulrichite associated with Turquoise on mindat.org. Libethenite 3 photos of Ulrichite associated with Libethenite on mindat.org. Opal-AN 2 photos of Ulrichite associated with Opal-AN on mindat.org. Quartz 1 photo of Ulrichite associated with Quartz on mindat.org. Pseudomalachite 1 photo of Ulrichite associated with Pseudomalachite on mindat.org. Schorl 1 photo of Ulrichite associated with Schorl on mindat.org. Smoky Quartz 1 photo of Ulrichite associated with Smoky Quartz on mindat.org. Powellite 1 photo of Ulrichite associated with Powellite on mindat.org. Fluorapatite 1 photo of Ulrichite associated with Fluorapatite on mindat.org. Sampleite 1 photo of Ulrichite associated with Sampleite on mindat.org. 8.EA.05 Orthowalpurgite (BiO)4(UO2)(AsO4)2 · 2H2O Orth. 8.EA.05 Walpurgite (BiO)4(UO2)(AsO4)2 · 2H2O Tric. Birch, W.D., Mumme, W.G., Segnit, E.R. 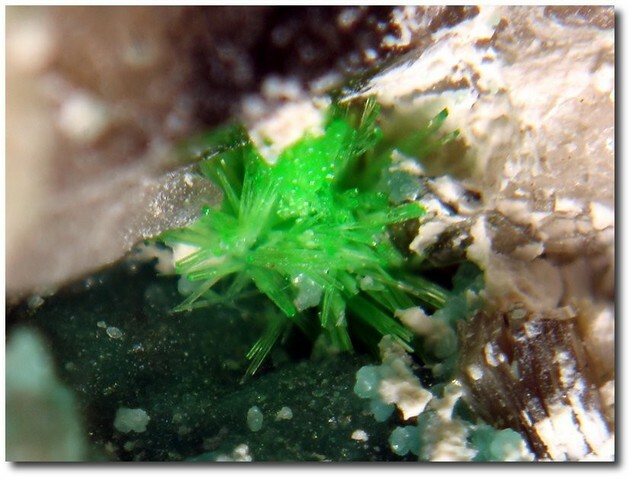 (1988) Ulrichite: a new copper calcium uranium phosphate from Lake Boga, Victoria, Australia. 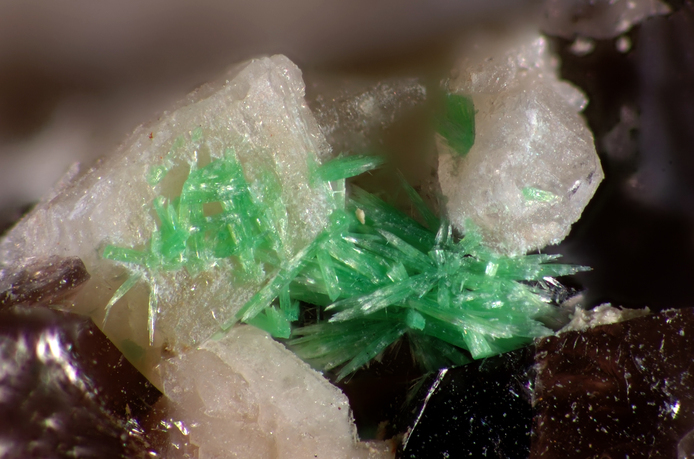 Australian Mineralogist: 3(3): 125-131. Jambor, J.L, Grew, E.S. (1990) New mineral names. American Mineralogist: 75: 240-246. Kolitsch, U., Giester, G. (2001) Revision of the crystal structure of ulrichite, CaCu2+(UO2)(PO4)2•4H2O. Mineralogical Magazine: 65: 717-724. Birch, W.D., Mumme, W.G., and Segnit, E.R. (1988) Ulrichite: a new copper calcium uranium phosphate from Lake Boga, Victoria, Australia. Australian Mineralogist, 3(3), 125-131.; England, B.M. (1991) The State of the Science: Scanning Electron Microscopy. Mineralogical Record, 22(2), 123-132 (SEM image of ulrichite on quartz from the Lake Boga quarry on p. 127). ; Clark, A.M. (1993) Hey's mineral index: mineral species, varieties, and synonyms. ; Birch, W.D. and Henry, D.A. (1993) Phosphate Minerals of Victoria. The Mineralogical Society of Victoria special publication N°. 3, 14-27.; Henry, D.A. and Birch, W.D. (1998) Sampleite and associated minerals from Lake Boga granite quarry, Victoria, Australia. 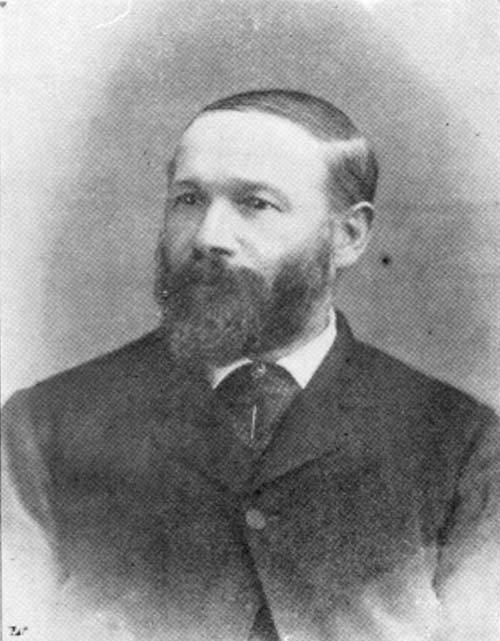 Australian Mineralogist Vol. 3 Oct.-Dec. 1988, 135-148.